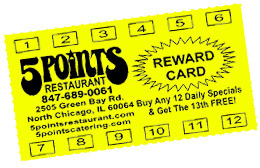 Great food and friendly service combined with our fun and bright atmosphere makes 5 Points restaurant a destination worth driving to. Our famous Chicago Dog and Maxwell Street Polish are the best in the area. We also offer sliced Gyros, Italian Beef, Burgers, Cheese Fries and a whole lot more. The salads are made fresh every day and the chili and soups are homemade. Our Broasted Chicken is the most tender and juicy chicken that you’ve ever tried. Every order is freshly battered and pressure fried to ensure quality. Other popular items include Shrimp or Perch baskets or our Chicken Strips w/Homemade Ranch. We have a hugh selection of ice cream treats – Fresh Strawberry Shakes, Delicious Banana Splits, Sundaes, Flurries, Dipped Ice Cream Cones or Slush to name a few. 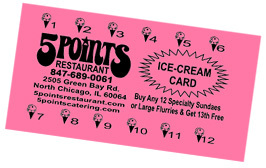 At 5 Points you will enjoy old time treats and comfort food in a clean environment and friendly service. We have indoor seating with satellite TVs and outdoor dining in the spring and summer. 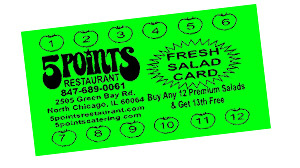 5 Points Restaurant is located next to the Great Lakes Credit Union and across from the Burkey Mall on Green Bay Road. We are open 7 days a week for lunch and dinner. Look for the giant red and white tent for outdoor dining in the spring and summertime. For fast order pick-up call 847/689-0061.